December 2012 ~ I Can Do That! Here's a nice idea for New Year's Eve celebration: cute mini cakes baked with champagne or non-alcoholic sparkling wine. I got the idea from here but used a different recipe for the cakes, frosting, fruit, and chocolate garnish. Happy Hanukkah to all my readers! Searching for fried food to make for the Jewish festival of lights holiday, Hanukkah, which began December 8 and will end on the 16th, I was surprised to find that the sweet snack called bimuelos which are very similar to the Filipino buñuelos are actually related. Although the recipes are different, they are both deep fried and served with syrup or honey or simply dusted with sugar. The tiny snacks are really really delicious drizzled with honey. It's also good with caramelized condensed milk but I prefer them with honey. I had for lunch all the bimuelos in the picture after photographing them. I couldn't resist the crispy crust and light as feather puffy honeycombed crumb. I'm seeing red food items everywhere, it's the season after all. 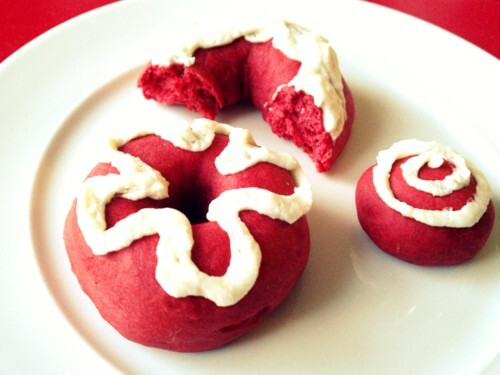 One of the baked items I wanted to make since I saw them in one of the blogs I visit are those cute red velvet cake donuts. I never liked cake donuts so baked them with yeast and topped with slightly sweet maple flavored whipped cream. You can also dip them in cream cheese glaze, if preferred. Yummy with either topping.